In the final analysis, content was never king. Creation was and still is. It’s distribution that has been devalued and the failure to make that distinction is what’s causing the so-called media crises. It’s also why the Grateful Dead made a fortune allowing people to bootleg their concerts while the recording industry was driving itself into near bankruptcy. Content is only king when it provides a window into the soul of the one who creates it. I believe our curriculum is WAY overbalanced toward content delivery; it is the fundamental change that must take place as we re-imagine the learning experience. But I believe there is a middle path. The best image I have found is from Bransford, Mosborg, et al, 2009. The example I frequently use comes from a decade of working with architects and builders in a massive campus redevelopment project. If you want to end up with great buildings, your working groups has to have a combination of ability (content) and skill (context). Great at inquiry and innovation, but no knowledge of how to swing a hammer or when to use screws instead of nails? You might draw a nice looking building on paper but it may be unbuildable. You need to know some basics of how materials work to constrain your reality. Great at how to nail boards together or how a plumbing system works, but no vision or application of the aesthetic? The building may hold up well to earthquakes and fire, but who wants to live or work in a concrete bunker. Just ask millions in Eastern Europe and Russia where one blueprint was used for every apartment building between 1950 and 1985. Let’s find this sweet spot, get away from pure content, but remember the fundamentals. I am part of a volleyball family, and one thing we know is, that from juniors to the Olympics, the team that wins does the basics well. 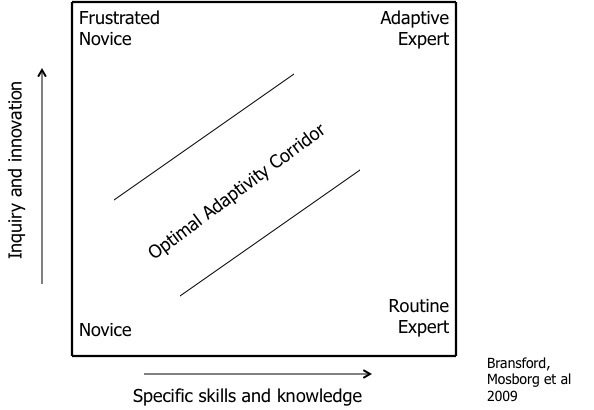 As we evolve our academic programs, let’s keep this sweet spot in mind, the Optimal Adaptivity Corridor. Thanks for the link Grant. I agree with your post, but think that my views were slightly misrepresented, so I’d like to clarify. Every form of creation is, in fact, a form of curation in some sense and therefore the better grounding you have in fundamentals and historical context, the more productive your creative efforts will be. Thanks, Greg, for this important clarification. Sorry if I put the wrong spin on it. Now I need to go look up Shannon’s Information Theory! Anyway, I had been meaning to get that graphic on Optimal Adaptivity Corridor out there in case others could use it; thanks for the prompt with your great post.